This group discount ends soon! Hurry up! There are just 16 Deals remaining! LIMITED TIME – LIMITED QUANTITY! 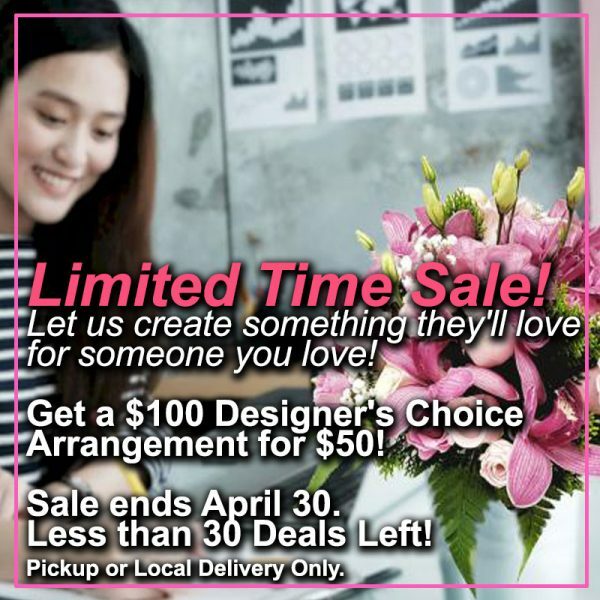 Get a gorgeous “Designer’s Choice” arrangement ($100 value!) for just $50! Let our floral artists make something one-of-a-kind and super-special for someone you love at a great price! Sale ends April 30. Only 100 Deals Available. In-Store Pickup or Local Delivery Only! Place your note, message or special instructions here. Delivery and In-Store pickup limited to weekdays between 9am and 5pm. Your pick-up or delivery date will be chosen on the checkout page. We cannot deliver on weekends. Allow 24 hours for order to process before pickup and delivery.